In previous articles (example), I have been arguing that investment is the major driver of the private sector cycles. (I am using the national accounting definition of investment, and not the act of purchasing financial securities.) We can now turn to the data, and the important question: how are we doing right now? As a disclaimer, I have just started to gather data, and do not have strong opinions about the state of the cycle. I will start off with a few punchy observations for readers who are really only concerned about the current state of the cycle; the rest of the article will be more theoretical. The key seems to be that the level of investment is not particularly high (relative to previous decades). Furthermore, we had a mini-cycle in the middle of this expansion, which reflects the ongoing recession calls by various commentators -- they were right that there was a slowdown, it was just not big enough to derail the momentum of an economy weighted towards the service sector. The next complication is that it is not enough to just look at the United States in isolation, large corporations are generally multi-nationals. From a recession-watching perspective, we need to look into the possibility that weakness elsewhere will infect the United States, even if we are only interested in U.S. economic outcomes. As a Minsky-ite, I am always looking for stories about debt-driven asset bubbles. 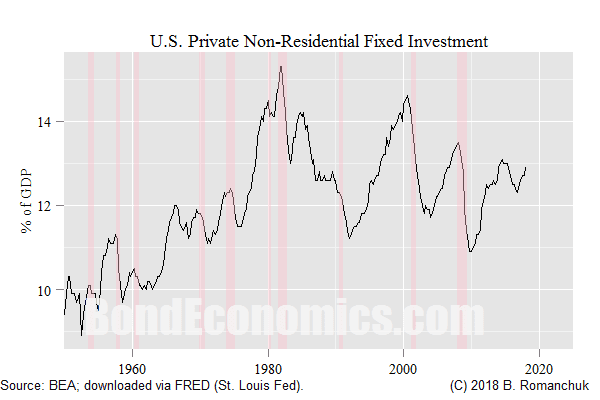 When I looked at the (non-housing) fixed investment data, the most plausible grounds for a doomsday narrative seemed to be in investments in structures. However, given that I have been continuously bearish on real estate throughout a multi-decade bull market, I think someone else would need to dig into that story. In summary, the recession case (ignoring the possibility of a policy-induced recession) revolves around finding an over-extended sector that will need to retrench. The moderation of investment spending implies that there cannot be too many candidates for vulnerability. Investment by government (which is a policy decision). Private Residential (houses, apartment blocks) investment. Private Inventory growth (not included in fixed investment). Private non-Residential (includes equipment, non-residential structures, etc.). The decision-making behind each category is different, and so there is no reason to believe that we can explain all of these types of investment with the same measured variables. (This is unlike simplified economic models, where all investment is under the control of some representative firm or household.) For example, if sales are rising, and the inventory-sales ratio is falling, we might expect firms to step up production in the near run to bring up inventory levels, regardless of their views on long-term fixed investment. As a result, we need to break our analysis of investment by category. 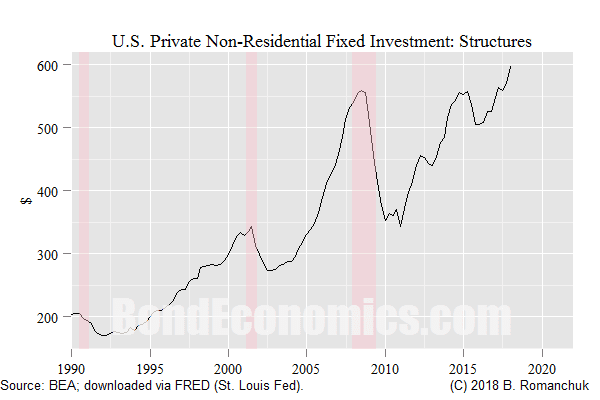 This article focuses on the last category -- private fixed non-residential investment -- which is depicted in the chart at the top of the article. My bias would be to assume that this category is the most important for driving the cycle, but as we saw in the 2000s cycle, residential investment may have become more important cyclically. Furthermore, government austerity policies (reducing investment spending by governments) mattered for the pace of the post-Financial Crisis recovery. Just displaying investment time series (like I just did) is not enough, we need to be able to predict what they might do. From a theoretical perspective, it would seem like capacity utilisation would be the most useful variable for forecasting non-structural fixed investment. The argument being that fixed investment adds to productive capacity, and firms would only see a need to invest if their capital is being run near capacity already. Although this story makes sense from the perspective of simple economic models and from the micro perspective of established firms, I am unsure whether it holds up empirically. The breakdown in logic revolves around the exuberance that occurs at the top of the cycle. Historically, we have seen sectors adding capacity based on wild extrapolations of future demand, and so their investment decisions end up bearing little resemblance to the reported capacity utilisation of more boring existing firms. For those who remain interested in the heteredox-mainstream economic theory wrangling, one major issue is the effect of interest rates on investment decisions. If we put aside investment in structures (which presumably are more interest rate sensitive), I would summarise the heterodox position that interest rates have no measurable effect on investment decisions. This is contrast to the alleged mainstream view, in which interest rates are critical for investment decisions. (To be fair, I am unsure that any serious non-academic mainstream economist really believes that, based on my reading of the empirical findings published by central banks.) I did not add interest rates to the figure above, but one may note that investment reliably peaks just before recessions -- when nominal and real interest rates also reliably peak. One would need to delve deep into junk statistical tests to "prove" that higher interest rates lower fixed investment (similar to the junk statistics used to "prove" that higher debt-to-GDP ratios raise interest rates). I will presumably dig into that relationship when I delve further into my business cycle research, but at this point, it seems like this is beating a dead horse. The alternative strategy for forecasting investment would be to rely on various indicators, with manufacturing purchasing manager sentiment indicators being the prime candidate. In historical backtesting, those surveys seemed to be the most effective (although their usefulness has been more questionable in the past couple of cycles as a result of the shrinkage of the manufacturing sector). It is straightforward to see why those surveys are effective: in order to invest in fixed assets, you generally to purchase tangible goods, and purchasing managers see that order flow. The fact that these data are surveys means that they are available faster than the more difficult-to-collect data from statistical agencies (and orders mechanically lead the actual purchases). The faster response time makes such surveys useful to possibly get a jump on slower-moving modes of analysis, but they cannot answer fundamental questions (e.g., why would orders slow in the first place?). As such, they might be useful for market timing, but may not help for longer-dated forecasts (unless the survey is already signalling a recession). On paper, being able to come up with a model to forecast fixed investment seems like a dry statistical exercise that a science like economics is supposed to be able to achieve. However, it ends up being theoretically equivalent to being able to forecast economic growth (and/or recessions) as a result of the feedback loop between investment and profits. It would be nice to have a mathematical model that can predict recessions (in some sense), but it would be similarly nice to have a model that can predict future bond prices. In the same way that various versions of the efficient market theory precludes the latter, I remain unconvinced that a mathematical model can predict the herding behaviour of capitalism, for roughly similar fundamental reasons. MY initial reaction was a question of meaning: what constitutes "non-residential fixed investment" in Brian's thoughts? A quick Google search yielded two possibilities: 1. Investment by FIRMS in tools and structures. 2. All non-residential investment. The second definition would include things like automobiles owned by the private sector. The first definition would limit transportation tools mainly to trucks used to transport product but could include railroads. Just a suggestion, but maybe you could offer your own definition of "non-residential fixed investment". I'll read this article again but probably no further comments. Thanks for the insights. You just need to track down the release from the national accounts. I just browsed the FRED database, but the release gives breakdowns in tables. You want to have idealised statistics where all spending can be categorised functionally. This is not possible (or too expensive to do); national accounts statistics are based on the data can be collected. This means that household spending is largely treated as consumption, and business spending can flow in non-residential investment. If I buy a computer, national statisticians have no idea whether I am I buying that to invest in my writing/consulting business, or to play online card games. So that part of retail sales (which they can measure) will (probably) end up being classified as consumption. This is also how spending on cars is treated, I believe. (Possibly that could be revised based on data from income taxes, but that data would only be available years later.) So this means that business investing is generally what is being counted. You would need to go through the national accounting definitions to get the full story. Now suppose it was decided to treat parts of consumption as investment - which might be more accurate from a conceptual standpoint. Investment would go up from a spending standpoint. However, it should be clear than financial saving did not change. The buyers of the investment wouldn't care how the government classifies this spending. Their financial saving is the same regardless.